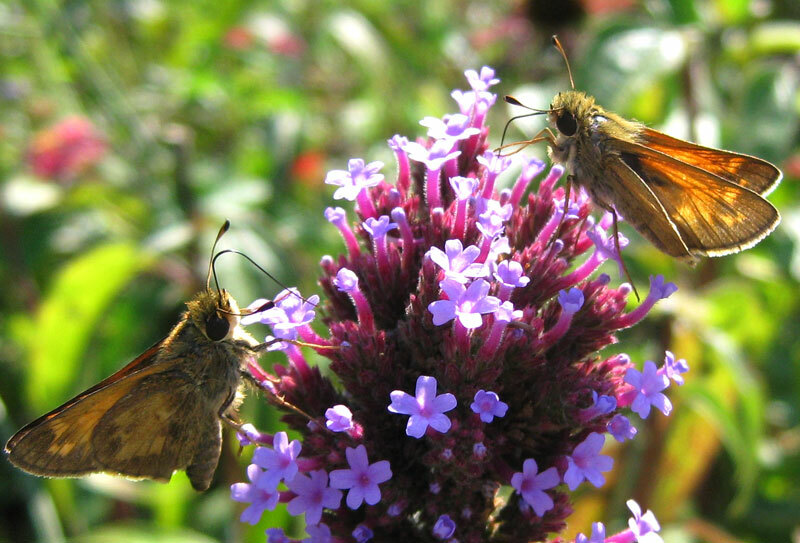 One of the most pleasant additions to my gardens in late summer are the hundred or so skipper butterflies that always show up. I mainly have Pecks and Fiery Skippers, but Sachem and Silver-Spotted Skippers show up also. Since I have lots of plants blooming during this time. there is no reason for them to leave and so they hang around through the fall. 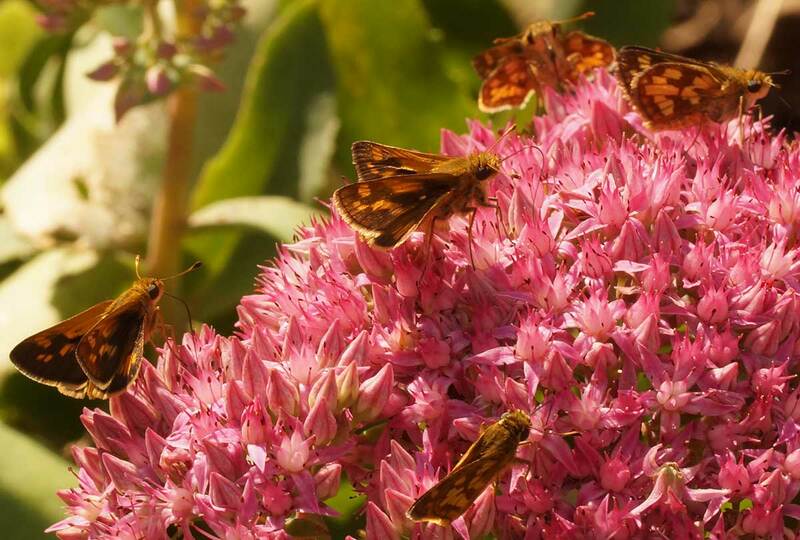 In the picture above, they are nectaring on a sedum named “Carl.”They love to nectar on it when it’s in the sun. One of their host plants is Bermuda Grass which I have in abundance. It’s a bit of a pain to keep out of my flower beds, but I’ve seen the skippers laying eggs on it, so it worth the extra work. I actually like Bermuda Grass for two reasons. 1. A lot of my grass is dying out from the 100 degree temperatures. My bermuda grass loves the heat and looks great. 2. Most important, fiery skippers use this as a host plant. 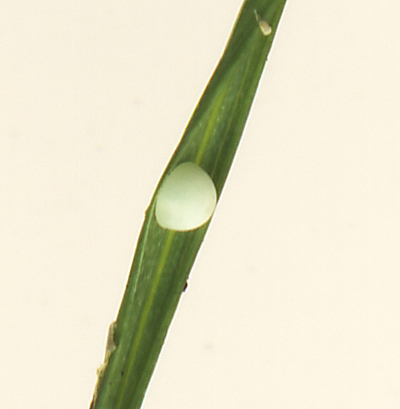 Here’s a picture I took this morning of a blade of bermuda grass with a fiery skipper egg. Probably other skippers use bermuda grass also, but I’ve only seen fiery skippers so far. Skippers – 162 or 5? One of the few butterflies I can count on every year are skippers. I’ve had a dearth of American Snouts, Spicebush and even Black Swallowtails, but the skippers always come through toward the end of the butterfly season in September. Just yesterday I went out and counted 162 skippers and I’m hoping for more. What’s interesting is that in a email conversation with a friend, they mentioned that in a whole day of counting at Busch Conservation Nature Area, they only counted five skippers. The difference is probably the Bermuda grass in my yard plus all the nectar plants I have right now. 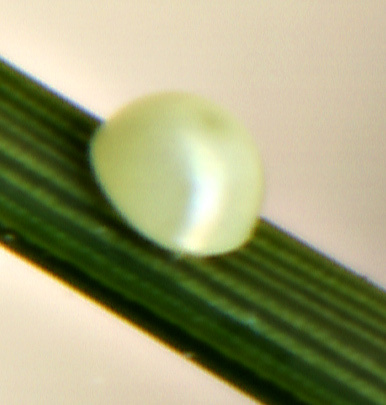 While I’ve always heard that bermuda grass is a host plant for some skippers, I’ve never seen them lay eggs on it – until today. Below is a picture of an egg which was laid before my eyes as I was working in the yard.